U-Boat deck gun, the research continues! Sometimes you go about as far as you can researching something, and you still don’t have the answers you crave. This happens surprisingly often with museum artifacts, as the chain of provenance and the wealth of detail that might have accompanied the artifact breaks down, and what you are left with is partial documentation, rumour, enigma, and frustration! Such is the case for me when I consider the German Ubts naval gun, 8.8cm, 30 caliber, serial no. 1972, produced in 1916 by Krupp, in their Essen works. Today this piece is on display in LeBreton Gallery, at the Canadian War Museum. This is a breech-loading, quick-firing gun that used a vertical sliding breech block. It was likely an adaptation of a design for torpedo boats and other small craft, and could stand long periods of immersion in salt water. I have now researched this streamlined submarine deck gun 2 times professionally and now lately, because it has become a grudge match. This gun is unique, and important, simply by its rarity. There are no others in Canada like it, and indeed, there is not even what you would expect would be more common, a deck gun from a Second World War U-boat. * There are very few of these in existence, and most were recovered from wrecks. It may be the only WW1 Krupp gun of its exact type in near perfect condition. The submarine campaign featured periods of restricted and unrestricted submarine warfare, where the imperial German navy tried to cut the supply lifelines to Great Britain and hamper the Allied war effort in Europe. Deck guns were used for shelling ships when the sub was on the surface, to save torpedos, or to allow the crews to evacuate. This gun might have sunk merchant ships and killed their crew members. There are two origin myths connected with this gun: One note in the file gave some fairly recent information that it had been linked to U-91. In the First World War, there were German subs named U-91, UB-91 (a smaller coastal boat) and UC-91 (a mine-laying boat). UB-91s gun has actually survived and is on display in Chestow, England. It is the larger 10.5 cm deck gun. UC-91 was sunk in the North Sea after the war. That leaves U-91, which is described in January 1918 as having been armed with the more potent mix of both a 10.5cm and an 8.8 cm gun. ** The second potential provenance is more strange, and features an army unit capturing (or at least laying claim to) the naval gun. In an inventory of war trophy artillery in Ottawa in the interwar era, this Krupp is clearly IDed, but is listed as having been claimed by the 72nd Infantry Battalion, Canadian Expeditionary Force (a Vancouver unit, today perpetuated by the Seaforth highlanders of Canada). This unit’s involvement with the gun is a key mystery. There are several possibilities, but they all seem a bit unlikely. Could the 72nd have picked it up somehow after the war from one of the boats being scrapped along the French coast or in England? Could both these provenance details be linked? For example, did the 72nd organize to have the gun brought back to Canada from where U-91 was being disassembled on the French coast? The search continues. *The closest thing to another submarine deck gun is a 76mm Japanese gun captured during the Kiska landings in the Second World War and today on display in Vernon, BC. This gun was of the right type to have been used on a sub, but was in fact part of a coastal battery when it was found. **Michael Lowrey, from Uboat.net, contributed many helpful details about this gun, KTB u-boat war diaries, German First World war submarine armament generally, similar survivors, and possible provenance. This entry was posted in Uncategorized and tagged Canadian War Museum, deck gun, naval gun, World War I, World War One by Warsearcher. Bookmark the permalink. Very mysterious. Are you going to continue trying to get to the bottom of it? Always, but I have run out of directions to pursue…short of exhaustive document ordering. I feel that there may be an error in the basic description of the gun. 8mm is about 30 caliber so your gun would probably be more accurately described as 300 caliber. Ahah! This lets me talk about the difference between caliber when applied to small arms (like you note above), and that applied to artillery. 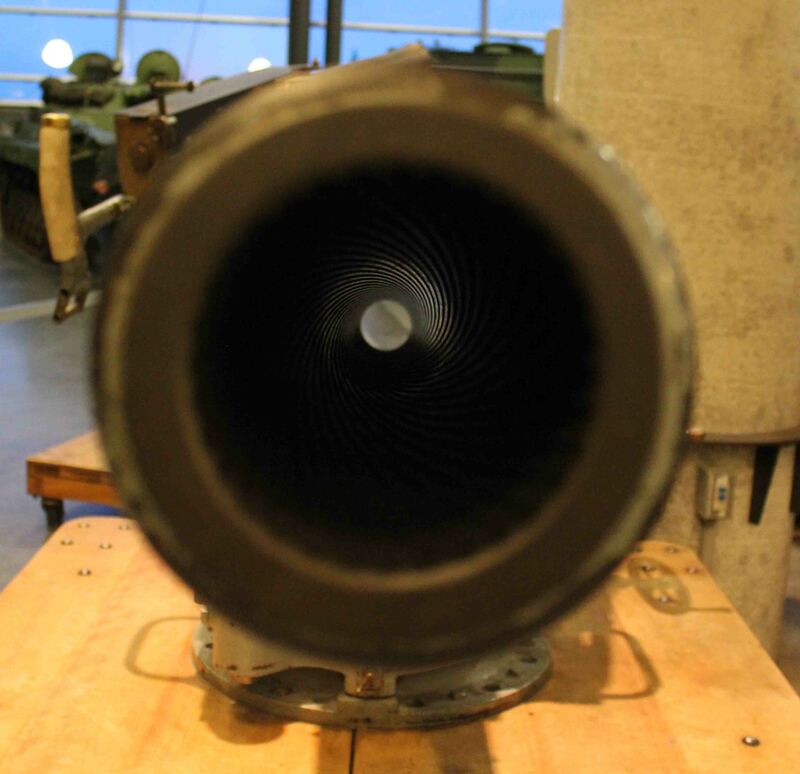 For artillery, caliber is a measurement of how long the gun’s barrel is as a multiple of the dimension of the bore of the gun. 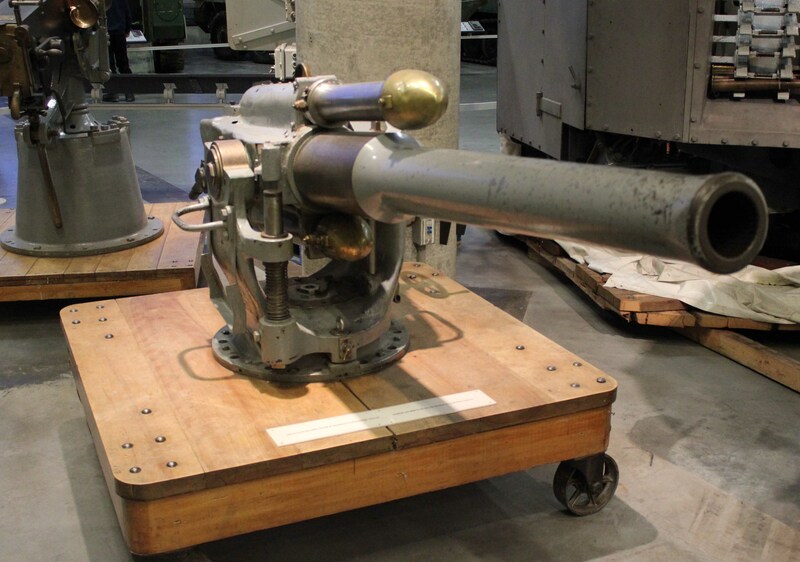 For the 8.8cm deck gun, the length of a 30 caliber gun would be 8.8cm X 30, or about 2.6 meters. If you are talking about a 9mm glock (.355 inch), no one bothers to say how long the barrel actually is! In heavy artillery, the number of calibers the barrel is translates into huge differences in the effective range. This is normally written like this 8.8cm L/30, to distinguish between the other common German 8.8cm, the L/35, which had a longer range. Thanks Timothy! I picked up a sight for this weapon some time ago and have been trying to establish some details of the weapon itself. Feel fre to email me if you would like photos.